Vegan, gluten-free sorghum tabbouleh salad. 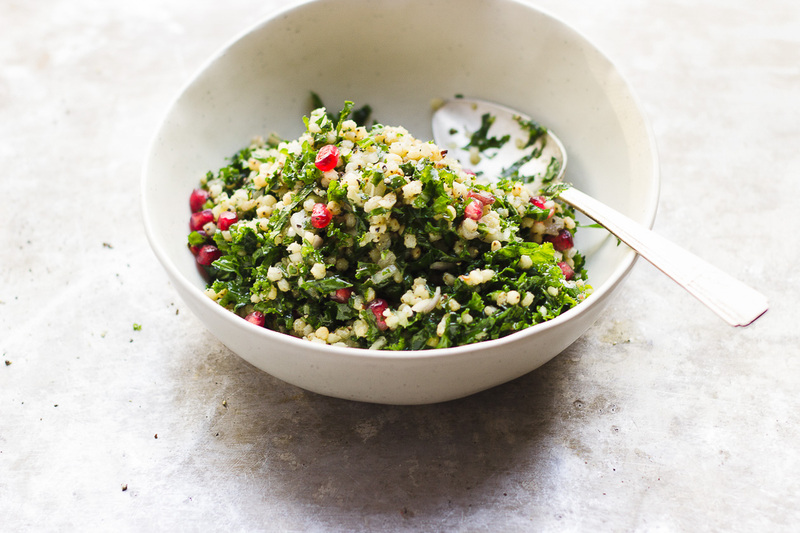 This winter tabbouleh salad is built with hearty greens, and a punchy citrusy-thyme dressing. Vegan, gluten-free sorghum tabbouleh salad. I’m going to keep it short and sweet today. Because, I’m working on limiting my screen time. I need to eat – we’re bordering on a hangry situation. There’s a freshly decorated tree in my house that I’d like to go enjoy. And, blast Amy Grant’s 1983 Christmas album. Maybe make these cookies too. I don’t know, I’m feeling pretty Christmasy right now. This post is brought to you by Dark Horse Wine. They challenged me to reinvent a classic dish that delivers an unexpected twist. Get it, Dark Horse? Unexpected? You get it. Traditional tabbouleh is comprised mostly of tomatoes, parsley, bulgar and lemon. This winter tabbouleh salad is rebuilt with hearty greens, and a punchy citrusy-thyme dressing. I’ve swapped the tomatoes for pomegranates, kale for parsley, sorghum for bulgar and clementine juice for lemon. The dressing is inspired by Tal Ronnen’s new vegan cookbook Crossroads, and by the way it’s a total beaut! The sorghum has a an awesome texture. Making this salad both substantial and light, and kind of perfect for all the holiday sugar and champagne in-betweens. 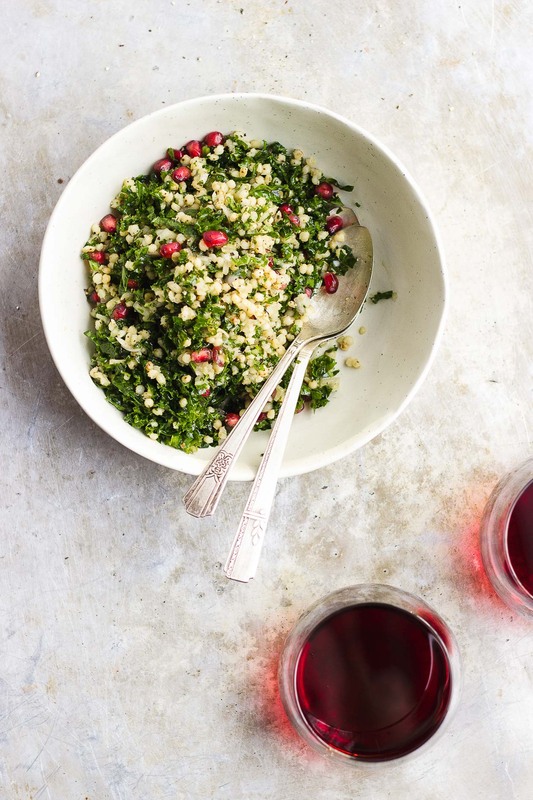 This winter tabbouleh is also quite jovial with all those greens and reds and whites. It’s bright and festive enough without being over the top. Kind of like these babes. Annnnd, pinot noir, especially Dark Horse Pinot Noir, pairs well with just about everything. This is no exception. Dressing inspired by Tal Ronnen’s, [url href=”http://www.crossroadskitchen.com/Book.aspx” target=”_blank”]Crossroads[/url]. If you don’t have clementines, tangerines, grapefruit or oranges will also work. 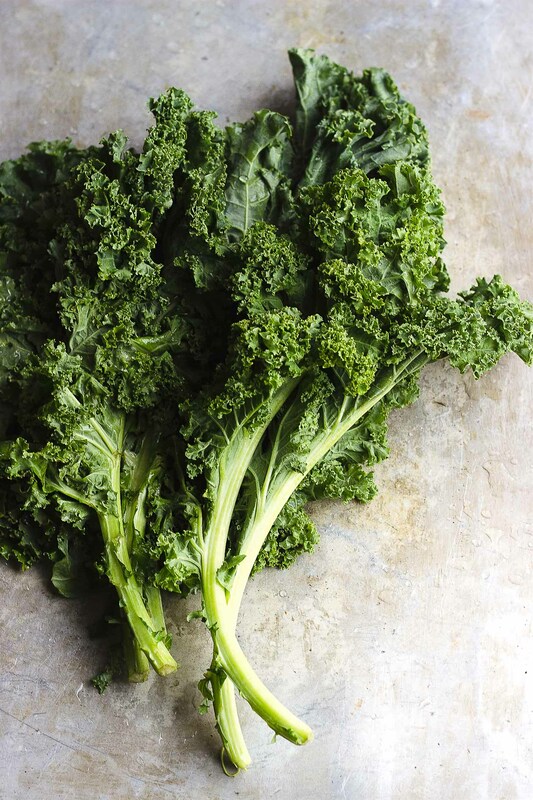 In a large bowl massage the kale with a tablespoon of olive oil, and a pinch of salt for 3 minutes, or until bright green and pliable. Then add in the sorghum, pomegranate arils, and chopped shallot. Mix altogether and set aside. In a small bowl mix together the clementine juice, remaining 2 tablespoons of olive oil, apple cider vinegar, thyme, salt and pepper. Pour the dressing over the salad, toss thoroughly, and season with more salt and pepper if desired. Thanks to the folks at Artisan Books for gifting me a copy of Crossroads! This post is sponsored by Dark Horse Wine; all opinions are my own. 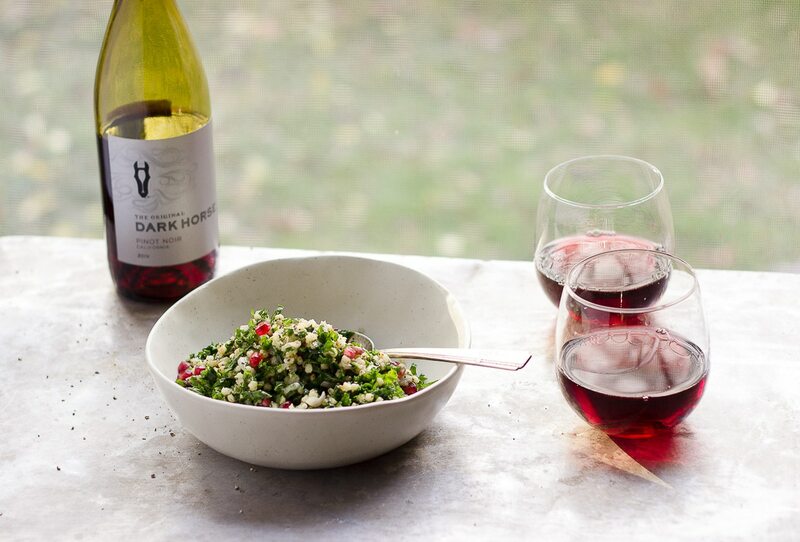 DARK HORSE PINOT NOIR AND SORGHUM TABBOULEH!!! 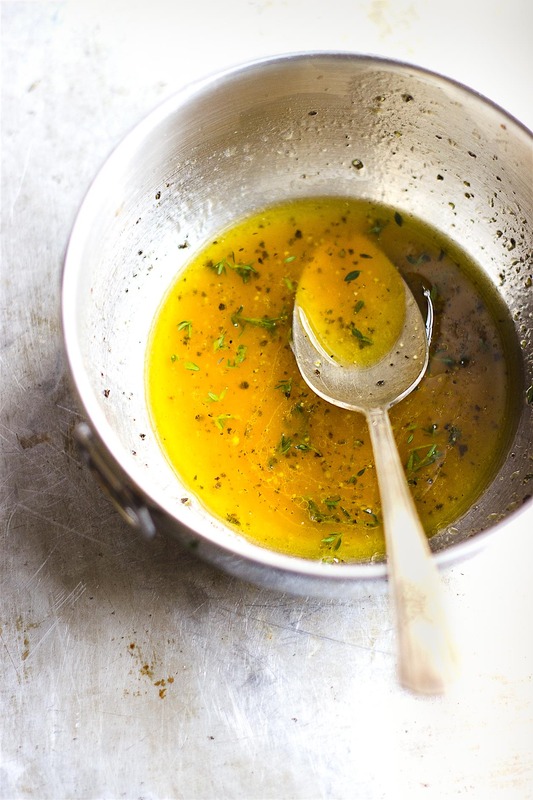 With clementine thyme dressing?! You’re a mad genius and I love it. Plus Amy Grant. Girllllll – what is even happening?! I adore you! Amy Grant is my Christmas soul sister. I mean I don’t even know who I am when I turn that album on. Sherrie, such a lovely tabbouleh (and such beautiful photography) – I absolutely adore the dark horse twist. Love that sorghum in combination with the kale and pomegranate. Much love to you, and I hope you are warm and enjoying the festivities. While we all overdose on cookie and cake posts at this time of the year, I love that your post offers salad. And what a beautiful one at that. I haven’t tried sorghum before. Looks delicious and I’m all set to try this today! Right?! My thoughts exact. Gimme all the salad. Oh, this looks so good! I really need a meal like this amidst all this holiday heavy eating. I should probably add this to my list of dishes to make because I feel sick over how much rich holiday foods I’ve been eating lately. K, now I’m off to enjoy my tree and listen to xmas music! Happy holidays, lovely lady!! There is just so much creative goodness going on here Sherrie! The flavours and textures. Just perfect. Topped tonight’s salad with the dressing, how did I never think to juice a tangerine before, d’oh!